Before I had my first baby and certainly after she was born, I was astounded by the lack of information available regarding infant oral care and the ways to prevent childhood tooth decay. 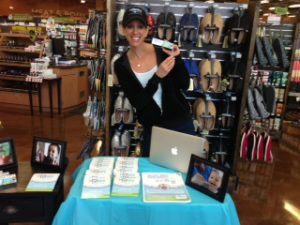 So, I put my 15 years as a dental industry professional to work as well as my experience being a new mom – I knew we had the opportunity to make a big difference. What makes Happy Teeth™ products so special is our dedication to one thing, and one thing only: to develop perfectly formulated, natural, gentle and safe baby dental products and educational tools to make it easy for new parents and caregivers, just like you, to understand the importance of your baby’s dental care. By having fun with your children while brushing and developing great oral care habits from the very start, even before the first tooth comes in, you can help prevent the #1 chronic childhood disease today – tooth decay. Our family would like to thank you for your commitment to your baby’s dental care and we are honored to be helping parents and caregivers understand their new baby’s dental needs. We hope you get as much joy and happiness celebrating your new baby’s dental health as we have working with pediatricians and pediatric dentist’s across the country to develop Happy Teeth™ products. From the very start, Happy Teeth™ products and fun educational tools make it easy for you to teach your baby habits that will ensure a lifetime of healthy smiles. And, please remember to speak with your dental or medical professional about your baby’s lifetime oral care.